NEW CONSTRUCTION! $0 Down Payment and Builder Incentives! 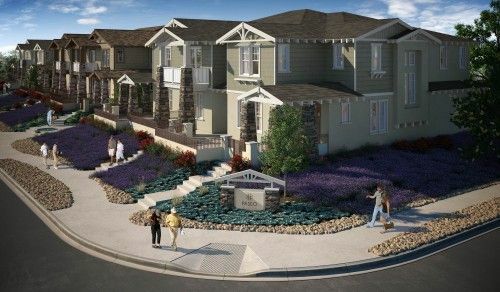 Situated in the vibrant town center of Ramona, Paseo Village Townhomes offer a unique fusion of urban living and country charm. Paseo Village's spacious three bedroom, two and half bath, two-story craftsman townhomes range in size from approx. 1,527 to 1,632 square feet. Each residence comes with two-car direct access attached garage and private patio. Residents will enjoy close proximity to local shopping, cafés, restaurants, galleries, wineries, award-winning schools, parks, hiking trails, horseback riding, and golf courses. Being only a short 30-minute drive from San Diego, Paseo Village is truly the place where Urban Living Meets Country Charm! $0 Down Payment financing and Builder Incentives available* For more information or to schedule your private tour, please contact us at: info@tbsreg.com or call 1-888-61PASEO. Visit our community website at: www.PaseoVillageTownhomes.com . *Financing and Builder Incentive: For FREE financing information and FREE loan pre-approval contact Hugh Tanner / laonDepot, (858) 449-1855, htanner@loandepot.com, https://www.loanDepot.com/htanner. Financing subject to qualifying, 30yr Fixed Loan, VA, FHA, USDA, 4.2% APR, interest rates subject to change without notice, terms and conditions apply. Builder Incentive is a limited time offer, call for details. Professionally Marketed and Brokered by The Blu Sumit Real Estate Group at Keller Williams Realty, Broker of Record CA DRE Lic. 01524589 , Broker Associate CA DRE Lic. 01037546.